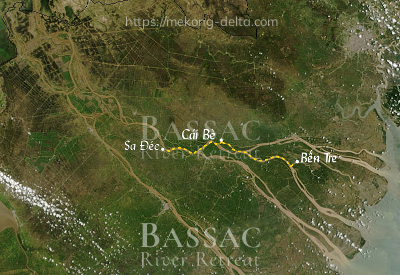 Enquire or book a trip along Sa Đéc - Cái Bè - Bến Tre. Boarding at Sa Dec at noon. Welcome drink, introduction to the ship and crew, check into the cabins. Mid-morning, check out and transfer to a local boat for an extensive visit of the Ben Tre islands: rowing through the arroyos shaded with water coconut trees, on a horsecart through to a honey farm where you will taste the local production, especially honey tea. End of services by mid-morning on shore at Bến Tre.